Director Luca Curci‘s conversation with the artist Kathy Rose about her experience at HIDDEN ROOMS – IDENTITIES . CITIES . MEMORIES in Venice. 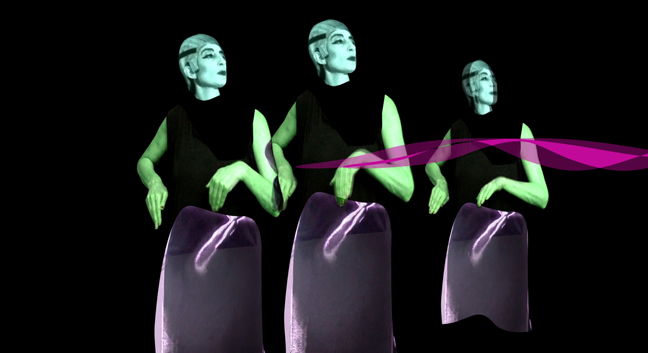 Kathy Rose’s work has evolved from her early drawn animated films of the 1970s, through her unique, pioneering performance work combining dance with film in the 1980-1990s, to her current surreal performance-video spectacles and installations, with influence from symbolist art and the Japanese Noh theater. Rose has received a number of grants including a Guggenheim Fellowship in Performance Art in 2003, 7 grants from the National Endowment for the Arts, etc. Rose has toured extensively in live performance throughout United States and Europe (Fondation Cartier pour l’art Contemporain, the Walker Art Center, The Kitchen, Institute of Contemporary Art in London, etc. ), and she has shown her videos at numerous dance/video festivals. She recently won First Prize in Video/animation at the East West Art Awards in London for her video “THE REALM OF NOTHINGESS“. Kathy Rose – I was unable to attend which I regret, as Venice is a city that intrigues me enormously. The work of the other artists was extremely high quality and quite wonderful and it looked like a beautiful exhibition. My experience with ArtExpo from where I am in the U.S. was very positive, and the organizers were very thorough and clear. K. R. – My videos “Rapture of the Petals”, and “The Realm of nothingness” were shown in “hidden rooms – identities . cities . memories”. “Rapture of the Petals” portrayed the secret lives/birth and flowering of beings at night in a hidden world. 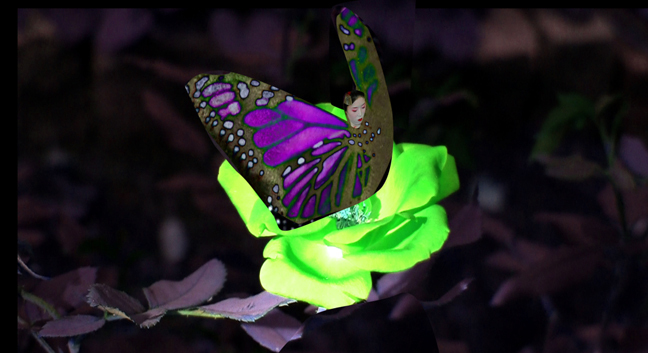 It explores an exchange of identities; flowers, women, and insects in an intriguing puppetry. “The Realm of nothingness” follows the identity of the artist. It is a spectacle portraying a hypnotic world in which figures flow and drip in a universe of their own as they proceed to a greater void. It is meant to show the wonder of it all, and the artist, enclosed by her irreality, enraptured by what she sees, sheds her iconographic puppetry self, and returns to reality. 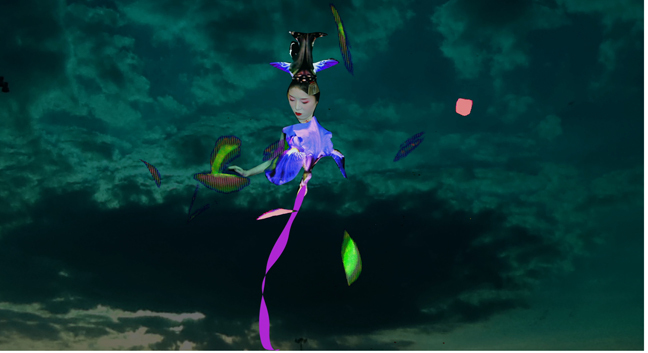 K. R. – I am working on two new videos – one of which continues some of the above explorations with video puppetry, touching on the idea of ritual – mingling birds and women in a Kabuki-like performance. 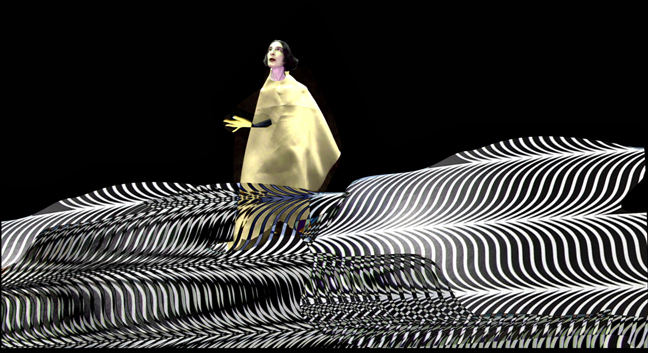 I am also working on another performance piece, entitled “Opera of the Interior” in which I will perform with hypnotic vortex projections on myself and fabric showing a travel inside the mind. K. R. – Art for me is a necessity. I require it for emotional and metaphysical balance, through its connection with intuition and the universe. It is a way of listening to yourself (as an artist or viewer). It seems to me that the art is a living entity – guiding me in its creation. I listen and I follow it. It seems to come from beyond. K. R. – I think this is a wonderful organization, and I have been very impressed by the work presented – in all genres. This is the kind of work that invigorates one, inspires and gives a reason to move onward. K. R. – There is no question that this is a great opportunity for artists to present work in a very evolved format, and often it seems in very interesting spaces. Therefore it is a very wonderful collaboration between the art and the organizers.